Algeria’s President Abdelaziz Bouteflika has resigned with immediate effect, after a two-decade rule, according to a statement relayed by the state news agency APS. The ailing 82-year-old leader announced he was stepping down, just hours after the army chief demanded immediate action to remove him from office. The announcement prompted celebrations in Algeria’s capital, Algiers, with people singing songs and waving flags in front of the city’s central post office. Hundreds took to the streets capping a wave of protests demanding the removal of an aging elite seen by many as out of touch with ordinary people and presiding over an economy riven by cronyism. 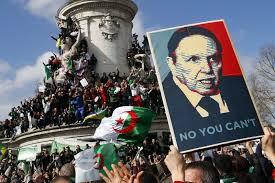 Bouteflika who suffered a stroke six years ago has rarely appeared in public since. Pressure had been building since February, when the first demonstrations were sparked by Bouteflika’s announcement that he would be standing for a fifth term. Despite Bouteflika’s promise not to serve out a fifth term if re-elected, along with a change of prime minister, the protesters rejected the offer.